Recently, I had the pleasure and honor of talking with Mort Künstler — one of the best and most famous of the many artists who did cover paintings and interior illustrations for men’s adventure magazines in the 1950s, 1960s and early 1970s. Mort is most widely known today for his more recent paintings of historical scenes from American history, especially his Civil War paintings. But before he gained his current fame as a historical painter, Mort was an exceptionally hard-working — and exceptionally talented — illustration artist. He created literally thousands of paintings for magazines, book covers, movie posters and advertisements. I’m a huge fan of Mort’s work. So, I was thrilled when he agreed to do a phone interview with me. I’ve only seen a few interviews with him online and they tend to focus on the historical paintings he has focused on since the 1980s. Mort, I know you were born in Brooklyn and grew up there during the Great Depression in the 1930s. And, I’ve read that you were interested in art at a very early age. MORT: Yes, I really was. The word Künstler means artist in German. And my father kept the original spelling with the umlaut over the u. He was an amateur artist himself and he discovered my talent at a very, very early age, when I was two-and-a-half or so. And, by the time I was in kindergarten I could draw very well. I was also sick a lot when I was a kid and my father would give me art supplies and set up still lifes or whatever and say to me: “Put down what you see.” I did. And, and I have drawings from when I was six to eight that show a complete room and furniture with a sense of perspective. I still have some of those drawings. I’ve seen some of your childhood drawings on the Mort Künstler Illustration Art Facebook site. You clearly had a grasp of the basics of art, like perspective, at a very early age. MORT: Yes, by the time I was twelve I could draw almost as well as I can today. Not with the same fluid ease, but I could put down almost anything there was given the time. Obviously, I’m much better at it now, but as far as putting down what I saw I could do it as well at twelve as I can today. Was there particular subjects you liked to draw or paint? MORT: I liked to copy all sorts of things out of the newspapers and I did what my father suggested and drew what I saw, from a glass of milk to a sandwich. Whatever I saw, I would draw it. As I got older, my mother would take me to art classes on Saturday morning at the Brooklyn Museum of Art. So, I had encouragement from both of my parents. MORT: I was probably about eight or so. I remember going Saturday mornings. Did you have any other formal training before you got to Brooklyn College? MORT: Well, as a matter of fact, I went to Abraham Lincoln High School, and there was a teacher there by the name of Leon Friend. He was very encouraging and extremely knowledgeable. He wrote a famous book on design. And, he really introduced me to other elements of art besides just putting down what I saw. So, he was very instrumental. His book is a collector’s item now. It was done in the Thirties and it talked about modern design, like the Bauhaus school of design, where they came up with theories of simplification. I see a number of things about Leon Friend online here, in a quick Google search. Is the book you’re think of GRAPHIC DESIGN, published by McGraw Hill in 1936? MORT: That’s it. You know, for a high school teacher during the Depression that book was a very impressive accomplishment. He inspired an awful lot of students that went on to great success in design and the advertising field. He was more of a designer than a painter. I don’t know of any painters that came out of his classes except myself. But he was an extremely inspiring teacher. He would be there when the birds got up, you know, and always said whenever you want something come in early and he’d work with you on whatever project you were involved in. One of the pages I see online about Leon Friend says he was inducted into the Art Directors Hall of Fame. MORT: Really? I barely know how to turn a computer on or off. But I knew there must be something about him on the Internet. Isn’t that wonderful! I didn’t know about that group. I’ve never been a joiner of any kind. I also see that he had another famous student named Alex Steinweiss, who’s famous for pioneering the design of record album covers. MORT: Yes, Alex Steinweiss was a student at Lincoln High School before me. He went on to design a lot of record albums and became quite a well known designer. So, after high school you went to study art at Brooklyn College? MORT: Well, I did study art there. But my main focus wasn’t actually art. I grew up to be a pretty good athlete. I was a diver on the swimming team and I was a hurdler on the track team. Had a lot of agility, I guess you’d say. When I went to Brooklyn College, sports dominated my life. Art was secondary. Although I did do a weekly sports cartoon for the school newspaper. I think it was called The Vanguard. According to the bio on your official website, you then when to the University of California, Los Angeles. Were you still more focused on sports than art at UCLA? MORT: Yes, I went there on a basketball scholarship. I was just going around the clock with sports, all year ‘round. Did you graduate from both Brooklyn College and UCLA? So, you focused on illustration at Pratt? MORT: Yes, but whoever got into the art school at Pratt started in their first year with what they called the “Foundation Year.” You did a bit of everything, until they got a feel for where your skills were. The illustration course was the toughest one to get into. When you got into that, then the second and third years you just spent all your time, painting, drawing, composing and learning as much as you could about illustration. I got into the illustration course and was considered an outstanding student. I was in the top group. When you graduated from Pratt, you were in New York in the early Fifties, where a lot of magazines and illustration artists were located. Did you go straight into magazine illustration? MORT: No, it was not that easy. In those days there were illustration studios that would provide space and materials and sales people who would sell the work. They worked on a commission basis. The fees were split fifty-fifty with the artist and the studio company. But all of them folded in the next five to eight years. They were all gone. But when I got out of school I was given good advice I think and that was to try to get a job as an apprentice at a studio. Apprentices would run errands, clean up the place, touch up paintings when the artist wasn’t available. And, that’s exactly what I did, while some classmates of mine were getting jobs at advertising agencies, and some went into television, doing sketches. Did your apprenticeship pay off by giving you a leg up on becoming a professional illustrator? MORT: Oh, yes. Out of the seventy people in my illustration class, I think there were only two of us who became magazine and book illustrators. It was strictly a freelance business. I never realized that when I was a student. But there were no real jobs except in advertising as sketch artists or whatever. They didn’t do finished art. I think I’m the only one who eventually did very well as a professional illustrator. It was not a good time to be going into the field. It was not a good time because most mainstream magazines were increasingly using photos instead of artwork? MORT: Yes, in the early Fifties, illustration was really starting to die. Color photography was coming in. Television was coming in. More and more advertising money was going to television rather than print, and a lot of people were getting their fiction over television rather than reading it. Many magazines that used a lot of illustration were folding and the trend among most of the ones that survived was to use photos instead of illustrations. Fortunately for me and other artists, some of them, like the men’s adventure magazines, continued to use a lot of cover paintings and interior illustrations. Who did you apprentice with? MORT: I apprenticed with a company called Neeley Associates. And, they didn’t last much longer either. But it was a wonderful opportunity because I saw how pros worked. They had a stable of artists. One guy did trucks and things, one guy did boy/girl illustration, one was sort of cartoony humor. It was a great opportunity to see pros working. And, I asked them a million questions. I didn’t last very long at it because I realized there was not much point in hanging around once I had learned whatever I could. After three months I left and I was fortunate because I could work at home in Brooklyn and was able to be supported by my parents for a period. I worked on painting samples for about two or three months. Then I went around with them and started to get work eventually. I read that your first job as a freelance illustrator was doing diagrams of football and basketball plays for SCHOLASTIC magazine. MORT: Yes, that’s really true, And, then I started to get little cartoon jobs from the same magazine, and then the next thing I know Scholastic was a giant organization and I started to get other work from them. Covers and illustrations for Junior Scholastic. Then I said to myself, go ask for jobs from publications that have work you think you could do better than. So, I’d go into bookstores and look for things I felt that I could do better and I’d write down the name of the publisher, get the address and then call for an appointment. Sounds like you were a very entrepreneurial artist. MORT: I was. And, every time I got a job and had a painting to do, I would do it like it was for the Sistine Chapel ceiling. I’d put a lot of effort in. And, before I would submit it, I would show it to some other art director who might be interested. And, then after about a year or two maybe, I never was a day without work, which is very unusual for the illustration field. Even the best guys I knew would sometimes face feast or famine. They would sometimes sit for a month and do samples. but I never did a sample again after about 1953 or so. Were most of your clients in the Fifties book publishers or magazines? I’ll bet he liked that. MORT: He did. [Mort laughs.] And, he took advantage of it. I did some full color paintings for him for seventy-five dollars, where he would have been paying a hundred or a hundred-and-twenty-five for some of those. But I ended up working for Dodd, Mead for years. I had a wonderful relationship with that guy and he gave me a lot of work and got me going. You also started out working for men’s adventure magazines very early in your career. 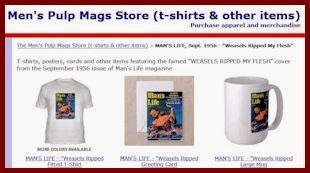 MORT: Yes, the men’s adventure magazines popped in very early. I remember getting my first illustration from Magazine Management, the publishing company owned by Martin Goodman, in the early Fifties. It was a black and white illustration for MALE magazine. After a while, I got my first cover for MALE in 1954 [the April 1954 issue shown at the top of this post]. Magazine Management also owned a paperback company called Lion Library. So, I also I did covers for Lion. And, every picture I did for the Magazine Management magazines and books, I always gave it my utmost, given the deadlines. 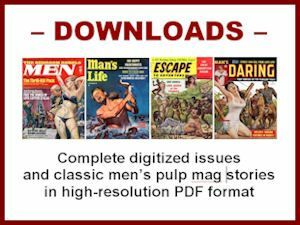 After you got started with Mag Management, were you courted by other men’s adventure magazine publishers? MORT: Yes, I started getting calls from rival publishers. And, I think artists are the same going back to Michelangelo. You want to make a living painting pictures. And, you’d rather be paid more than less for the same picture. So, they started to compete for my services. I ended up doing most of my work for Magazine Management because they made me a great offer. They could do that because they were the biggest, especially in the men’s adventure market. Not in terms of circulation of the individual magazines. But they had many magazines. TRUE magazine was the cream of the crop in circulation, ARGOSY was number two, and I did work for both TRUE and ARGOSY later. You provided artwork for most of the top Magazine Management magazines, like MALE, STAG, FOR MEN ONLY and MAN’S WORLD. MORT: Yes, the art director at Magazine Management [Mel Blum] said “We’ll give you as much work as you want. We’ll just keep you busy.” And then they matched and surpassed the other offers to where they were paying me more than TRUE and ARGOSY. So, Magazine Management took me through the Fifties and into the Sixties. I would just churn out work for them. I worked 12 hour days, 15 hour days, sometimes seven days a week. Almost always six days a week, from nine o’clock in the morning to ten or eleven at night. Were you working out of your own studio at that point? MORT: Well, at first I was working at home. Then I started working in a studio with another artist you may be familiar with because he did a lot of men’s adventure stuff, George Gross. Yeah, of course. He was great! MORT: George’s family was friends with mine. I used to call him Uncle George and I chose him as my mentor. If I was in Manhattan showing my samples, I’d stop by his studio. And, finally, he said “Hey, let me talk to the guys here.” He was renting space in an art studio of sorts. They did point of sales advertising display work and stuff, and George rented space from them. They had drawing boards and were doing lettering and those sorts of things and he said to them: “Why don’t you give this kid a drawing board, and he can do spots for you, whatever is necessary?” They did and it was wonderful. I didn’t have to commute back and forth from Brooklyn all the time. And, I could give a New York phone number, which was a big deal. I wasn’t just a kid working out of his house anymore. You were in your mid twenties at that point? MORT: Right. And, George sort of took me under his wing, and he taught me whatever he could. It was a wonderful thing for me. You know, he’s quoted extensively in the book THE AMERICAN SPIRIT, one of the books about my historic paintings that came out in 1986. 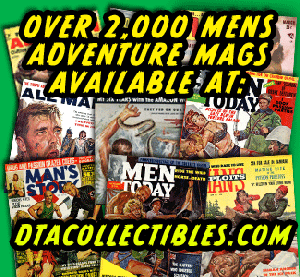 Anyway, from then until around 1965, I did a lot of work for men’s adventure magazines. 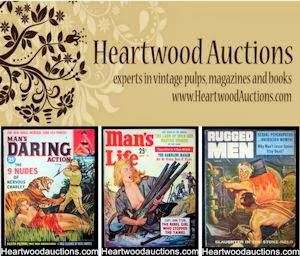 I also did some work for hunting and fishing magazines, like SPORTS AFIELD and OUTDOOR LIFE, and for AMERICAN WEEKLY, which was a Sunday supplement in the newspapers. I did a lot of work for them. I didn’t do much in the way of advertising, even though that was always considered the cream of the crop, because it was the highest paying work. And, I did some work for SATURDAY EVENING POST. I can’t even remember all of them. It’s so much. Did you cross paths with artist Norman Rockwell when you worked for the POST? MORT: I spoke to him on the phone several times, but I never had the pleasure of visiting with him. I wanted to but he was just too busy. It’s funny, I’m kind of at that point right now. I’m usually too busy to be able to see people who just want to stop by and meet me. We get calls from all over the world. It’s sort of amazing to me. I can’t quite believe it. We recently got a call from some people from Holland who just wanted to shake my hand and I did meet with them. So, I do meet people sometimes. But most of the time I just can’t. So, now we’re up to the mid-1960s in your career. That was kind of another turning point for you wasn’t it? MORT: Yes, in 1965 I got my first real historic painting assignment for NATIONAL GEOGRAPHIC, for a story about the history of St. Augustine, Florida, and that eventually led to a whole new era for me. You can read Part 2 of my interview with Mort by clicking this link. I encourage you to learn more about this great artist by visiting his official website and by buying some of the excellent books that feature his historic paintings. Also be sure to check out the website that focuses on Mort’s illustration art — KunstlerIllustrations.com — and the the Mort Künstler Illustration Art Facebook site, as well as the gallery of his paintings on American Art Archives. 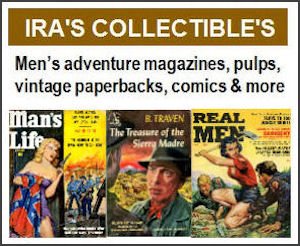 To see some of my previous posts about Mort’s men’s adventure art, click on his name in the Artist Index section for this blog and scroll down past the two interview posts — or, click some of the links you’ll see when you Google “Mort Kunstler” + MensPulpMags.com.